Recommended Websites | Reid Vanderburgh, MA., LMFT. Gender Neutral Bathoom listings. This website contains information so important to many transgender people, I put it first. If you know of a gender-neutral bathroom that isn’t on this list, please add it via the above website. How to Create a Transgender-Friendly Workplace. This downloadable handout answers common questions people have about what rights trans people have when they are ready to switch bathrooms at work. Information about Binders. This website contains information about chest binding, which is so important to many transguys, I put it near the top of this web page. Chrysalis Counseling (Hawaii) – Laura Acevedo, a former Portland resident, has set up a private practice as a therapist, on Hawaii Island. She is specializing in sexual orientation and gender identity issues. For information you may e-mail Laura. Clinic Sanssouci – I recently met an FTM who is about to undergo phalloplasty; he did a great deal of research and selected this clinic in Germany. FTM Health Guide – Excellent resource for medical information. Free download. Harry Benjamin Standards of Care – The complete text of the current SOC. Free download. Health-Law Standards of Care – Informed-consent based replacement for the Benjamin Standards of Care. Hormone Information – Recommended by a transwoman, this website offers a lay-person’s explanation of the effects of hormones. MTF Aesthetic Surgery Center – A client had SRS through this Bangkok clinic in the fall of 2007 and was very pleased with her results. MTF Surgeries – Rating Surgeons – A client used this site in choosing a surgeon. Each surgeon has a rating, based on how clients felt about various aspects of the surgeon’s services. Outside In – Outside In houses the Trans Clinic, and administers the Identity Project, helping trans people with their name change and DMV gender change processes. Dr. Sara Becker – Dr. Sara Becker’s website. A trans physician located near Portland, she has over 800 trans patients in her practice. Strohecker’s Pharmacy – Strohecker’s is a compounding pharmacy specializing in fertility issues. This expertise in hormones serves their trans clients well. Their hormones cost considerably less than the name-brand, because they are compounding their own. They do mail order. Be a New Creation Spa – Seattle-based business providing a holistic approach to well-being, offering various services from massage to permanent hair removal. Human Rights Commission, Washington State – Washington state has changed its policy re changing the gender designation on driver’s licenses or state ID cards, check this website for the current policy. Community of Welcoming Congregations (CWC) – Feeling the need of a new spiritual home? This organization works to help congregations become welcoming and affirming, open to GLBT parishioners. Check out their website to find a congregational home. Ingersoll Gender Center – Seattle-based support organization focused on trans issues. NW Gender Alliance – Northwest Gender Alliance website (MTF/crossdresser support organization based in Portland). Portland PFLAG – Parents, Friends and Families of Lesbians and Gays – excellent support organization also offering support for friends/families of trans people. Portland Transgender Resources – Transgender resources in Portland, Oregon. This resource list is maintained by T/IRC (Trans/Identity Resource Center). Q Center – Portland’s queer community center and also where my office is located. Salem Transgender Resources – Transgender resources in Salem, Oregon. www.sisterhouse.net - Sisterhouse is an organization providing support for crossdressers. Portland Tranzguys – Resource site for transguys across the spectrum. Washington County Unitarians – Looking for a spiritual connection in Washington County, Oregon? Try the Unitarians! I did a presentation to a group within this congregation, and felt like I was talking to PFLAG (Parents, Friends and Families of Lesbians and Gays). Wash. Gender Alliance – Resource for transgender folks in northern Washington state. Based in Bellingham, north of Seattle. Human Rights Campaign – HRC has put together some excellent resources about various aspects of coming out, particularly useful for workplace transition issues. International Foundation for Gender Education – IFGE is an excellent resource for printed materials and books related to transgender issues. IFGE publishes Transgender Tapestry, an excellent journal with a wide range of articles about various aspects of the trans experience. National Center for Transgender Equality – NCTE works at a national level, but also supports local and regional organizations when issues come up at those levels. Phyllis Frye – Trans attorney Phyllis Frye has done a great deal of work on issues of trans civil rights, both in her home-base (Houston, Texas) and at the national level. Transgender Law and Policy Institute – Excellent resource for news about legal/policy aspects of living trans. Trans Youth Family Allies – TYFA’s mission statement: TransYouth Family Allies (TYFA) are parents, family, friends and caring adults dedicated to educating and raising public awareness about the medical and cultural challenges faced by children with gender variant and gender questioning identities and the families who love them. Barbie Scott, vocal coaching – Barbie helps transwomen retrain their vocal production to sound more female. COLAGE – Support network for children of GLBT people. Their mission statement: To engage, connect, and empower people to make the world a better place for children of lesbian, gay, bisexual, and/or transgender parents and families. Dr. Becky – Informative website, maintained by a physician. Includes name change/birth certificate change information for all states. Extended-wear Hair – Recommended by an MTF client who bought a hair system from this company. She only has to remove it once every few weeks. This is powerful for her, as she is bald otherwise and this allows her to wake up with mussed-up hair like any other woman. Families Joined by Love – Support network for LGBT families. Books, resources and various discussion forums. F.O.R.G.E. – Wisconsin-based support organization: For Ourselves Reworking Gender Expression. FTM International – FTM International is one of the oldest FTM-support organizations in the world. Helen Boyd’s blog (en)gender – Helen Boyd is the author of “My Husband Betty” and “She’s Not the Man I Married.” Her extensive blog is a great resource for partners of trans folks. Hudson’s FTM Guide – Extremely comprehensive site geared toward FTMs. International List of Therapists – Though I can’t guarantee this is comprehensive (or up-to-date), it can provide a start for those who would like to find a trans-savvy therapist. Love Tribe – Website devoted to helping people find community, wherever they live. Open to trans people, but not trans specific. Manifest PDX – A non-profit men’s wellness community in Portland, empowering men to pursue their wellness passions together through programs like yoga, cycling, Eco-hikes, meditation, healing touch classes, vision teams, wellness coaching, and more. Transmen are welcome. 503-223-8822 x1. Gender Spectrum Education and Training – Training, education and consulting services on gender variance in children. Two support groups for families of gender variant children, both at Children’s Hospital (one in Oakland, CA and the other in Seattle, WA) GSET also produces an annual conference for families of gender variant children called The Gender Spectrum Family Conference. The Gender Spectrum Family Conference is held annually over Labor Day weekend in Seattle. TransFaith Online – TransFaith Online is dedicated to supporting transgender folks in our faith journeys, while providing useful resources to help Church folks become better educated trans-allies. Trans support site – Some thought-provoking articles, with an upbeat attitude. Transgender Guide – Great website with lots of good articles, and potential contacts with other transgender people. Transmentors International – This unique organization is dedicated to helping trans people find mentors in their area, to help them through the early stages of transition. 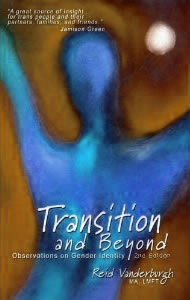 Transgender Soul – Excellent resource for information on a variety of mental healthcare related topics. TS Road Map – Excellent site for helping people plan their transition step by step. Virtual Facial Feminization – Recommended by a transwoman client who wanted to see what she might look like if she underwent FFS (facial feminization surgery). Alexandra uses software to approximate what a person might expect to look like post-FFS.